It appears to me that we could be very close to some significant inflection points (trend reversals) within the financial markets & as such, I want to share some of the sectors & asset classes that stand out as bullish (long) or bearish (short) to me that this time. Bearish. The two videos published earlier today highlight some of the potential bearish developments as well as some support levels & other technical developments that could trigger intermediate to longer-term sell signals but for the most part, haven’t done so yet. We did, however, recently get sell signals on the US markets via the breakdowns below the 60-minute bearish rising wedge patterns highlighted on the 60-minute charts of ES (S&P 500 E-mini futures) and NQ (Nasdaq 100 futures). While those corrections have met my minimum price targets & may or may not be over, my expectation is that there is more downside to come next week with the next sell signal to be triggered on a break below this week’s lows in NQ & ES (as well as SPY & QQQ). Also, reference the previous post on the IWM short trade entry & setup posted earlier today supporting the case for a pullback in the small cap stocks. My expectation for a correction in the US Dollar has not abated or diminished despite the fact that the dollar extended its gains since that case was first laid out earlier this week. 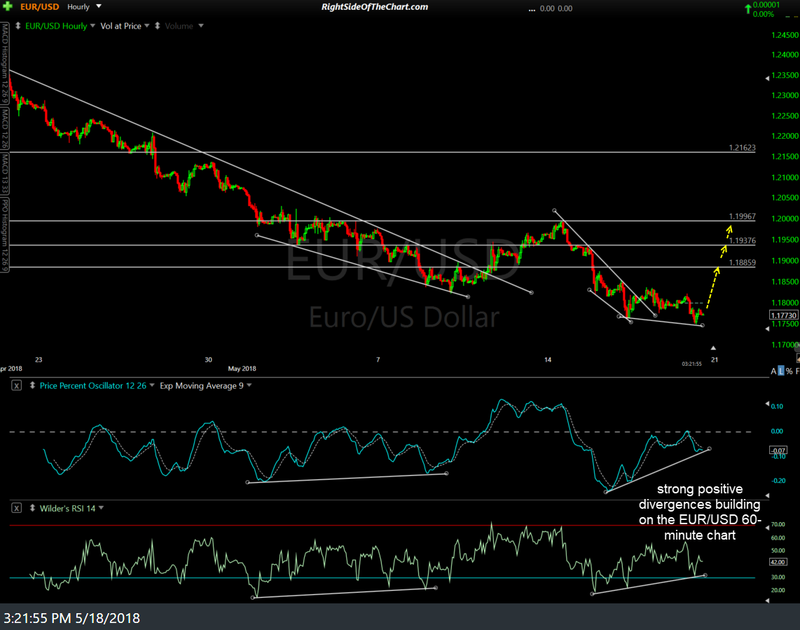 Strong positive (bullish) divergences continue to build on the 60-minute chart of EUR/USD & are likely to play out for a rally in the Euro/correction in the $USD in the coming weeks. Should the dollar correct in the coming weeks, that would likely provide a headwind to gold as well as GDX, which is still an Active Long Swing trade Also note that at times, securities that typically have an inverse correlation with the US Dollar will move in sync with the dollar instead of against it. 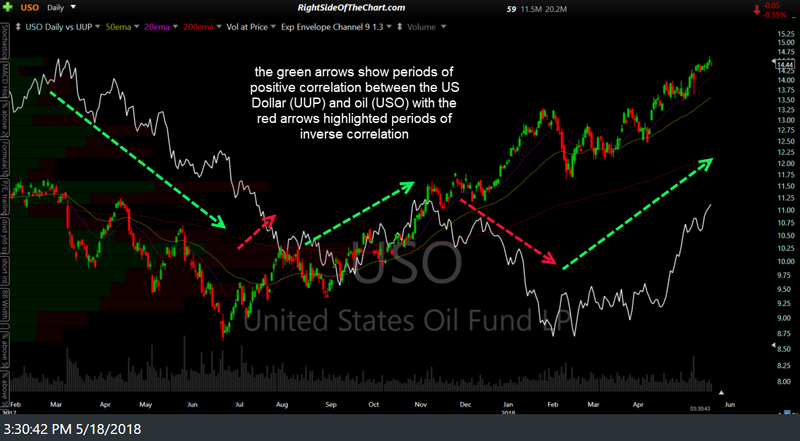 These temporary disconnects of the usual inverse correlation can last for several weeks & even many months at times as highlighted in the chart of crude oil (USO) and the US Dollar (UUP) below. Therefore, my expectation for a rally in gold & GDX as well as a correction in crude oil does not hinge exclusively on my expectation for a correction in the US Dollar panning out. Of the two, the inverse correlation between gold & $USD is more consistent than that of crude & the dollar. 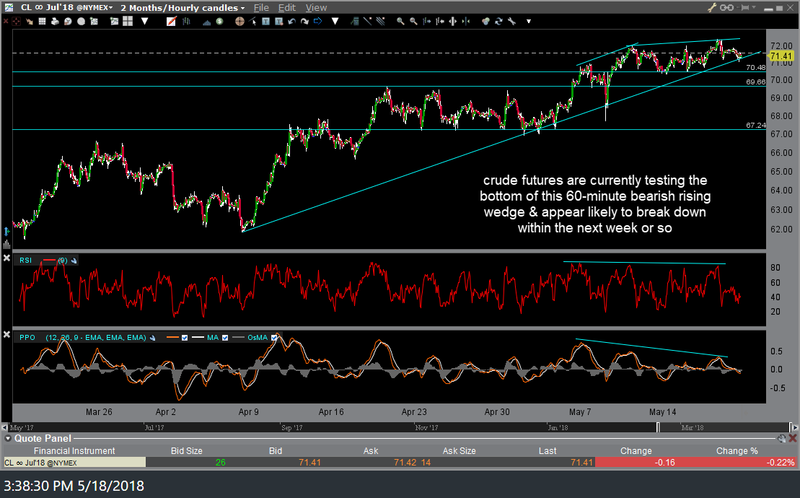 Crude futures are currently testing the bottom of this 60-minute bearish rising wedge & appear likely to break down within the next week or so. 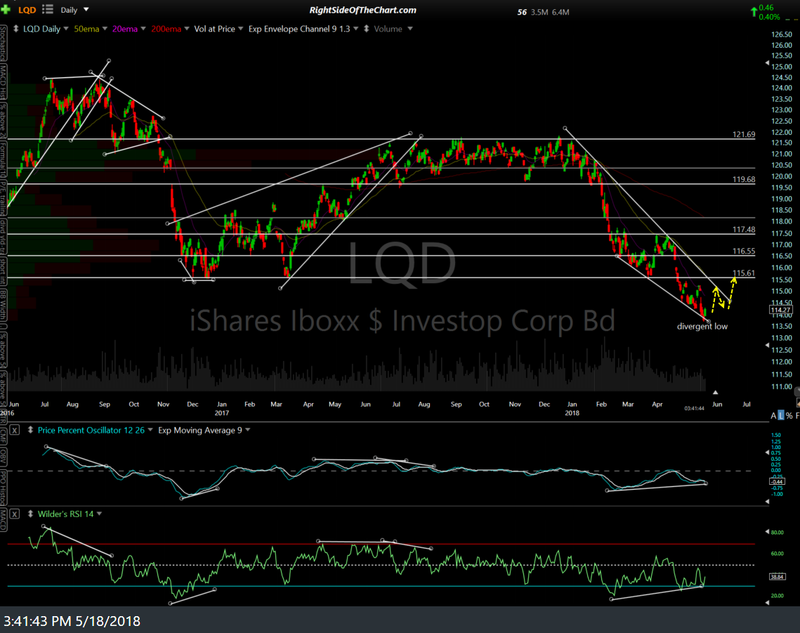 I remain near to intermediate-term bullish on bonds, particularly US treasuries (IEF & TLT) and investment grade corporates (LQD) while neutral to cautiously-bearish on high-yield/junk bonds (JNK, HYG). 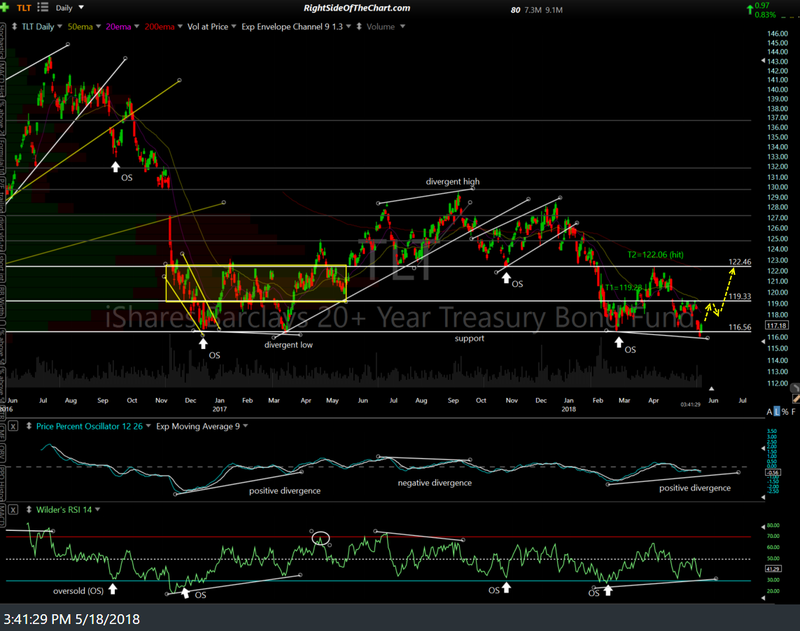 My bullish outlook, despite both TLT & IEF both clearly in downtrends, is based both on their technical postures (see charts below) coupled with my expectation for more downside in the stock market in the coming weeks & possibly months. Should the latter prove to be the case (weakness in the stock market), that would almost certainly translate into lowered expectations of the future trajectory of rate increases by the Fed, which in turn, would translate into a weaker dollar & falling interest rates/rising bond prices. A big IF, of course, but that is my current expectation. I’m still bullish certain commodities such as coffee (JJOFF active long trade) & sugar (SGGFF, which may soon be added as an official trade) and bearish others such as crude oil, lumber & livestock (COWTF). Also, while really in a category of its own more closely related to currencies, I’ve been highlighting this 60-minute bullish falling wedge on /GBTC (Bitcoin futures) in the trading room recently with a couple of follow-up posts today just before & after GBTC broke above the pattern. 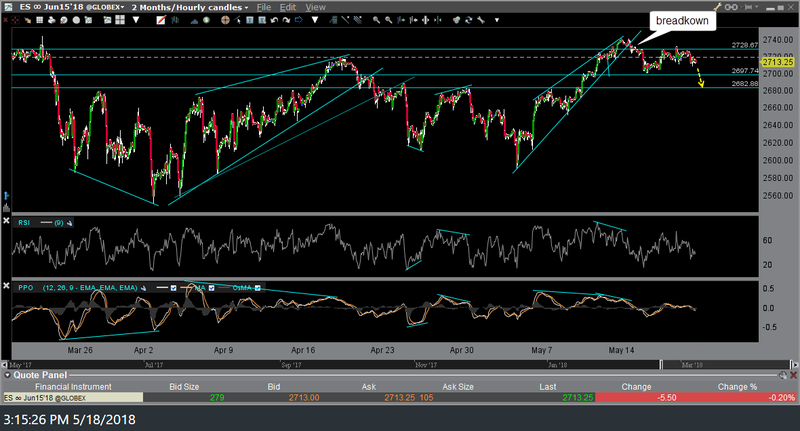 My price target is 8840 which would constitute a rally of approximately 9% from the point of today’s breakout. GBTC is another trading proxy for Bitcoin for those that don’t have access to a futures account as GBTC trades on the pink sheets as a regular security. While this list of various asset classes & trade ideas that look compelling at this time is from from comprehensive, I just wanted to combine some of the recent trade ideas that have been highlighted into one single post to help tie in the overall picture, or at least how it see it at this time. NIce recap Randy. Have a good weekend. Same to you. I had intended on covering some of the sectors within the stock market that stand out as the most bullish or bearish but the post started to get too long & I was trying to get it out before the close, which I just missed. However, I did cover all 11 sectors within the S&P 500 in the 2nd video today & one of my favorites (which is a sub-sector of technology/XLK) is the semiconductor sector (SOXX, SMH, XSD) on the short side as well as the financials. That good to hear JF. 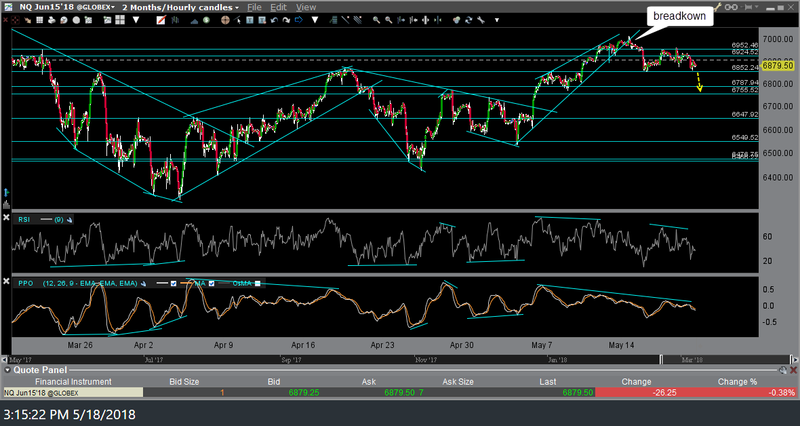 Always prefer it when our analysis aligns & I can’t say that for 98% of the talking heads in the media. I heard that gold is heavily manipulated and won’t go up. Is that the case? How? 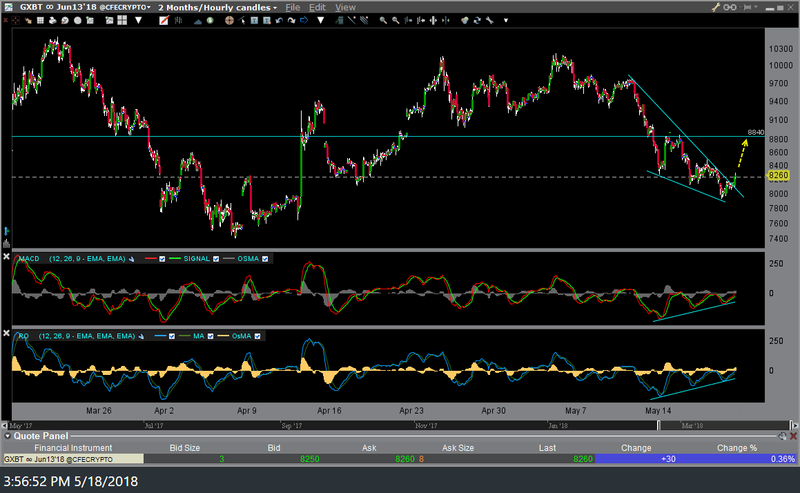 any thoughts on GT coming out of its falling wedge?